Kaanapali Beach is the most famous address on Maui and The Whaler sits directly on the beach! There is no better location with the fabulous restaurants, boutique stores, live entertainment, all located along the boardwalk directly next door to The Whaler. Not to mention the wonderful accessibility to all the water sport excursions that depart from Kaanapali Beach. Sunset Catmaran trips, snorkeling and scuba adventures, or for those more daring the heart pounding para sail trips. Of course you can always take advantage of the many Whale Watch trip in season or just sit back and watch the Whales from the comfort of your own lanai! We love The Whaler and we've been told we have one of the best locations on the property. Our unit is only two back from the oceanfront and has the most spectacular ocean views. We travel a great deal, but we do spend a good amount of time at our Maui home. We furnished it in a tropical motif with an accent on comfort and practicality. Our kitchen is supplied with everything you could possibly need even roast a turkey! Our living room has a queen sleep sofa in order to accommodate up to 4 people. We of course have cable TV along with a CD player and DVD player. Our master bedroom features a very comfortable king size bed with a TV and an ensuite full bathroom. We also have a second bathroom just off of the living room. You can walk out onto the lanai from either the living room or the master bedroom which also features a magnificent ocean view. In fact the ocean view is visible from every room in our home excluding the bathrooms. Our lanai is quite spacious and is our favorite place to start our day each morning. We also have wireless INTERNET ACCESS available from our unit for added convenience. Should you be interested in planning some island activities or just wish some general information about the island prior to your arrival just let us know. We have a personal concierge service that also provides grocery delivery service. Why not plan to have some staple supplies already stocked for you upon your arrival...no need to stop on the way in from the airport (it's the last thing you feel like doing after that long trip). We have a professional management company located on island to look after every detail and to be at your service 24/7. You're never without assistance. So call us and let us accommodate all your needs on Maui. Maui Beachfront Rentals, is a division of Maui Realtors Inc. and has been a provider of licensed vacation rental management services for select properties on Maui since 1997. We offer a seasoned team of professionals who have a thorough understanding of the needs of our customer base, and how it equates to long term customer loyalty. Our strong consumer confidence is largely attributed to our quality control protocol, with emphasis on customer service. All of our vacation rental specialists have first hand knowledge of each condos amenities and the services offered at each resort. Their expertise extends to accommodating special requests for items such as grocery in room delivery, welcome baskets, crib rentals, car rentals, island activities and much more. Our Lahaina Towne location offers close proximity to all properties, allowing our Rooms Inspection team regular monitoring of each unit ensuring the highest standards are maintained. Our office is opened 7 days a week and operates after hour emergency services. Covered parking. Included in Resort Fee. The Whaler is a wonderful property. It is well taken care of. Everyone who works here is extremely helpful and friendly. It is in a perfect location. Thanks for the glowing review, Stephanie. We're so glad you had such a good stay. We appreciate you being our guest, and hope you do come back again soon! Mahalo! We have stayed in this unit for the past 10 year and consider it our Maui home. Perfect location with south facing balcony that allow for extra sun time if desired. Remodel was a huge upgrade. Kitchen well supplied with utensils and kitchenware. Boogie board, sun chairs and often more toys available in unit. Staff now recognizes us by site and Welcomes us back each year. Pool is perfect and conversations are easy to engage. The perfect location? We couldn't agree with you more! Thank you so much for your kind review, Barbara. It was our pleasure having you as a guest. We hope you do return again in the future! My wife and I stayed in this condo four years ago and loved it. This time we brough our kids (5 & 8) so that we could stay longer. The kitchen remodel is wonderful. The unit is very clean, comfortable, and quiet. The Whaler is an excellent property in a wonderful location. We enjoyed the Whaler's village, Black Rock, and of course the Tiki Bar. We enjoyed breakfast in the morning and bbq'd at night. No need to eat out as everything you need is provided in the kitchen and on the property. The tide was very strong while we stayed so we took our kids to Baby Beach which is a 5 min. drive. The reservation process was simple and fast. We will continue to stay in this unit whenever we vacation in Maui. A return after four years? So good to have you back Ben. Thanks for returning. We consider it our greatest measure of vacation success for our guests that they return again. It was our pleasure having you as our guest. Here's to hoping you visit again us third time and more! Thank you! The wife put me in charge of planning this trip/vacation, since she usually does it for us. I choose this condo after much trepidation and chewing of fingernails. Well, we just got back and the wife gave me an atta boy and a kiss, so I must have done something right. I choose the condo because the price, location, and how nice the pictures of the condo looked. For a vacation rental my wife and I were really blown away by how clean it was. The place had the comforts of home that we needed, and there more to do in the surrounding area then we could get to in our week and half stay. I would highly recommend this condo and definitely staying on Maui. Truly a unique paradise. Thank so much for making sure this old boy did right. So glad you and your wife had such a good time. We understand it's difficult when trying to plan a trip, and we do all we can to make the process easier on you. Thank you for kind review. Please come back and visit again. Thank you for giving us the opportunity of staying in your condo for a week during May (16th-23rd), 2015. It was such a delight to see how gorgeous the remodel was not to mention several other things we enjoyed such as how it was decorated, the double bathrooms, the washer & dryer (a big plus! ), but most of all - the view was spectacular. We fell in love with it immediately and feel safe in saying it was the best place we've stayed since we first started coming to Maui years ago. Thank you again for sharing your slice of HEAVEN!!! A slice of heaven. We will always take that as an apt description for our property. Thank you so much for such a kind review. It was our pleasure having you as our guest, and we hope you do consider returning again in the future. We stayed 5 nights in this condo with our 11 month old. The kitchen and both bathrooms had just been remodelled and looks beautiful! The kitchen appliances, benchtops, sink, tap etc were sparkling new. It was spacious and looks so much better than our home! Both bathrooms also looks nice with the new renovation. Having our own washing machine and dryer was definitely a plus! The view was wonderful, and the staff esp conceirge Nathan were very friendly. There were ponds on the grounds with carps, beautifully tendered garden. We ate breakfast on the balcony every morning. The condo is right next to the The Whaler village and was very convenient. Would definitely stay here again. Thank you so much for such a kind review, Lisa. We are keen to make sure you get the most of our vacation experience here on Maui, and that ALL expectations for fully met. It's was our pleasure having you as a guest. Please do come back. 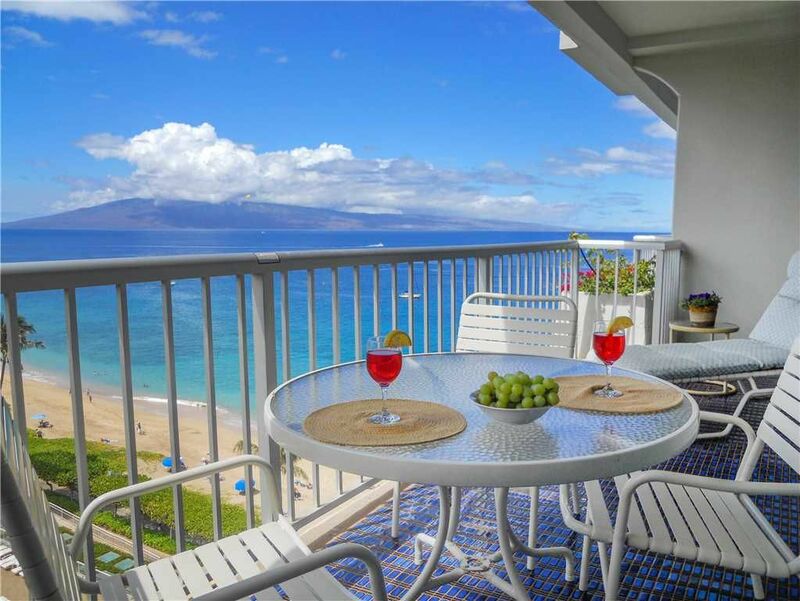 Located in the heart of the famous Kaanapali Resort directly on Kaanapali Beach. Boardwalk front this property provides eash access along the beach to all area attractions including the largest outdoor shopping mall at Whaler's Village, live entertainment, boutique shops, fine dining and casual dining and all water sport activities including catamaran excursions, whale watching trips (in season) trips to outer islands and more!